September 17 | 2018. Crossing the St. Lawrence and More. | Peter M. Schloss | J.D. - Mediator. September 17, 2018. Crossing the St. Lawrence and More. After overnight camping near Baie Comeau we returned to Godbout for our 11 a.m. ferry crossing to Matane on the south shore of the St. Lawrence. This is at least the 12th time that we have transported our car and trailer aboard a ferry. Every time feels like a bit of an adventure as we slowly drive across noisy metal ramps, occasionally scraping the hitch, and descend steeply into the bowels of the vessel. On this occasion the ferry was one of the huge ocean capable varieties. We were the first cargo on and the first cargo off. As we waited to load we watched a seemingly endless parade of vehicles that had originated on the south shore depart the ship. There were motorcycles, transports, RV’’s, and even a huge 40+ wheel semi bearing a construction crane. The crossing took a little over 2 hours but the ship featured unexpected comforts that were more akin to those found on some cruise ships. There were luxurious recliners, a first rate cafeteria, and a topside promenade that was abandoned to the cold damp weather. I spotted a couple of Minke Whales, and there was even a report of a huge Blue Whale sited about 2 miles ahead of the ship. Once on shore we began making our way to our overnight destination, the municipal campground at Trois-Pistoles. Along the way we beheld a large lighthouse situated on the Pointe-au-Pere promontory and detoured to have a look. The unusual lighthouse was built in 1909 and at 108 feet tall it is the second tallest in Canada. It features a large 3rd order Fresnel beacon that is visible for 22 nautical miles. I would have taken the tour to the top but the lack of time and the dense approaching fog bank dissuaded me. However, there was a submarine to tour! 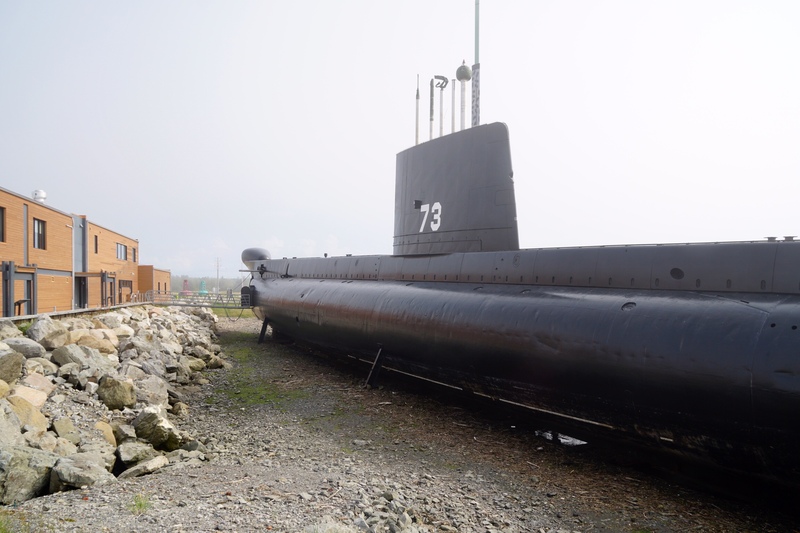 The Oberon class submarine, Onondaga (S73) was launched in 1965, commissioned in 1967, and served in the Canadian Navy for 33 year. It was retired from service in 2000. It is the only sub open for tour in Canada. The vessel is 295 feet long, displaces 2, 400 tons, and its 2 x 3,000 horsepower electric motors could propel her at a speed of 12 knots (14mph) on the surface and 17 knots (20mph) submerged. Her batteries allowed her to cruise submerged for 3 days at a time and only required 3 hours to be fully recharged by the two huge diesel generators. She was capable of safely diving to 1000 feet. In the course of her lengthy career she traveled over half a million miles. With the crossing of the St. Lawrence the focus of our travel has shifted to a homeward journey. ← Paula Clouse, 9/4/1949-8/10/1993. Courage and Tragedy. What a fabulous adventure everywhere! With all the background, it is so educational and inspiring. The submarine pictures are incredible too! Thank you! Love sub tours! Rebecca not so much. I am in agreement with the rest of the commentators.